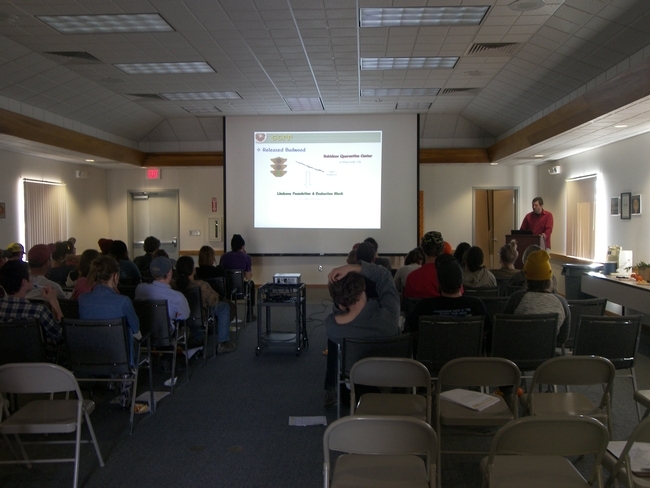 Around 25 members of the California Rare Fruit Growers recently visited Lindcove REC. The event was sponsored by the Sequoia chapter of the club, and Therese Kapaun (Staff Research Associate) was on hand to guide the visitors through the Demonstration Orchard, which contains 180 varieties of citrus. Visitors tasted fruit at their leisure. Of particular interest this year were the blood oranges, notably the Boukhobza orange, which is similar in many ways to a Tarocco-style of blood orange. 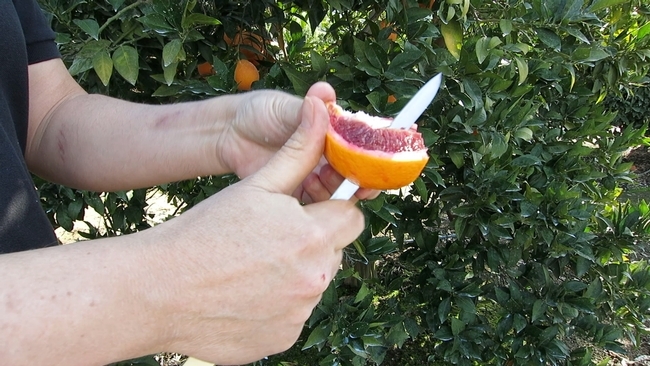 Do-it-yourself citrus grafters can purchase clean budwood for more than 300 varieties from the Citrus Clonal Protection Program website http://www.ccpp.ucr.edu/budwood/budwood.php for a nominal fee. For questions regarding the clean budwood program contact Dr. Rock Christiano at rock.christiano@ucr.edu. Visitors can wander through the Demonstration Orchard at their leisure. Photo by Dan Willey. 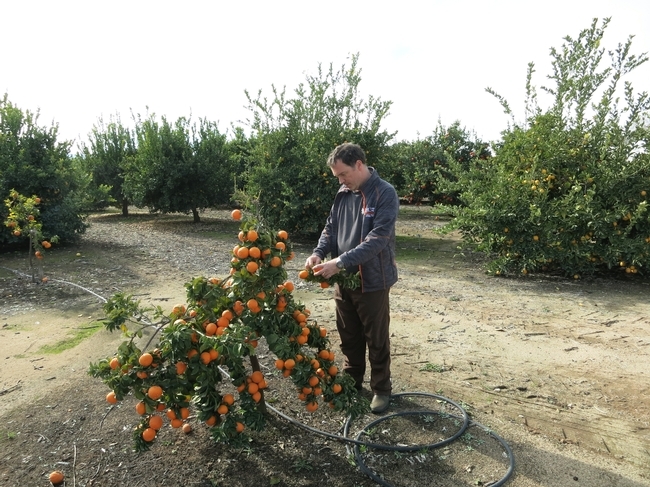 Adrian Buckley examines the Bouquet de Fleurs sour orange. Photo by Dan Willey. Bream Tarocco blood orange. Photo by Dan Willey. Lindcove REC was kept busy during the World Ag Expo, which is held annually in Tulare. This year's event took place from February 10-12 and was visited by more than 100,000 attendees. 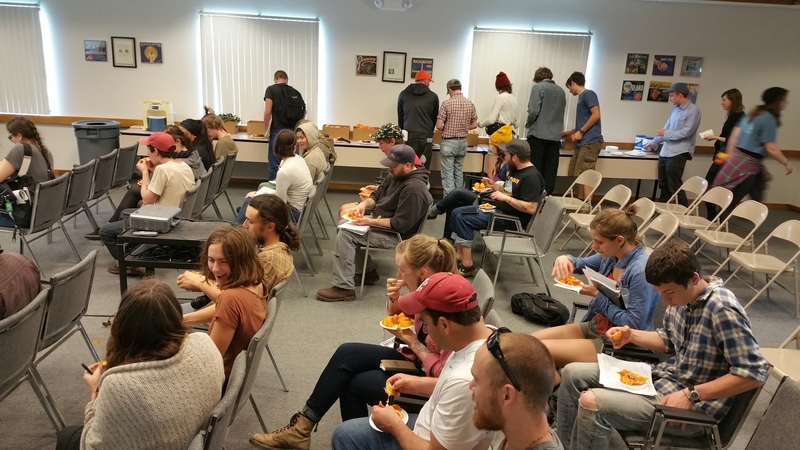 Busloads of visitors came to LREC for fruit tastings, guided tours through the Demonstration Orchard, informative talks by Therese Kapaun about the research projects here at the Center and by Dr. Rock Christiano of the Citrus Clonal Protection Program about the clean citrus budwood program. 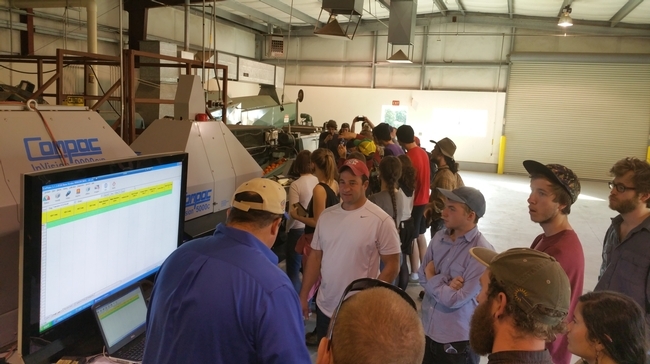 One group toured the packline and listened to Donald Cleek explain the types of measurements the machine can record. We were delighted to receive high school students from Utah, college students from Washington, a group on an Ag Expo tour to visit nearby ag-related industries, and citrus growers from Morocco and Mexico. Dr. Rock Christiano explains the importance of the clean citrus budwood program.